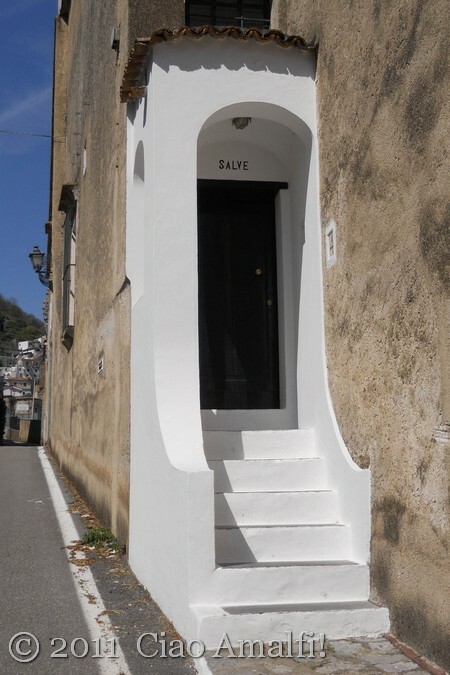 I pass this whitewashed entrance to a house on my usual walk, and every time the work “Salve” painted above the doorway catches my eye. This common expression of greeting in Italian simply means “hello,” but I always wonder about it as I pass by. I’ve never seen anyone coming or going, there are never any flowers outside on the stairs and the walls are always perfectly white. Who lives inside this house with such a welcoming expression painted above the doorway? Maybe one of these days I’ll find out as I walk by! 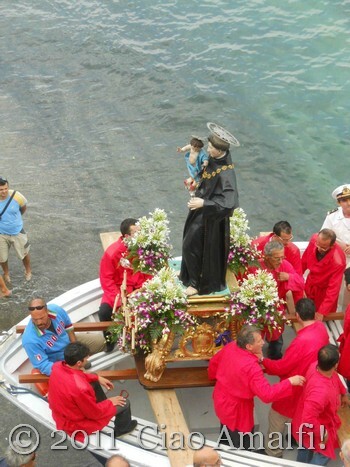 I haven’t been to Capri yet this year, but I’m itching to go! The island is stunning in so many ways, and it’s one of my favorite spots in the area for taking photographs. 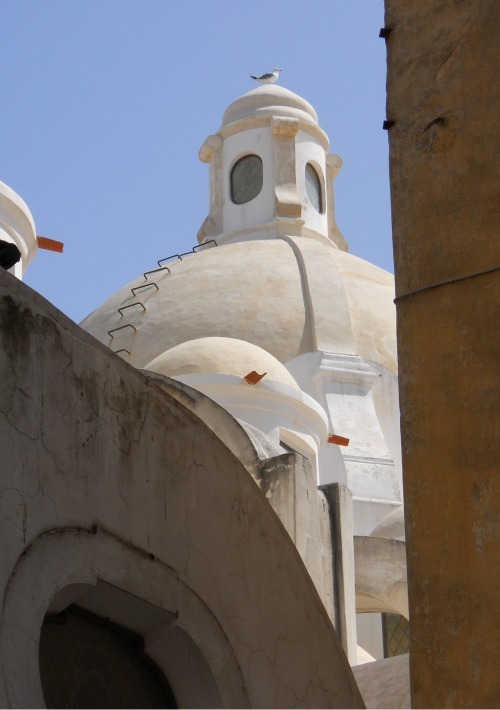 I took this photo of the dome of the Santo Stefano Church at the end of last summer, and I don’t believe I’ve shared it here yet. 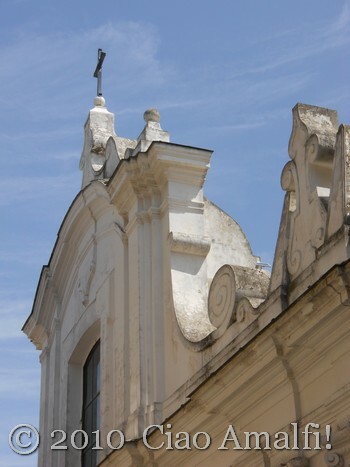 I love this church, both inside and out, and I highly recommend stepping away from the chaos of the Piazzetta to see the beautiful interior and explore the quieter streets nearby. I spotted this seagull enjoying the view from the top of the dome, and I wished I could see Capri through his eyes. 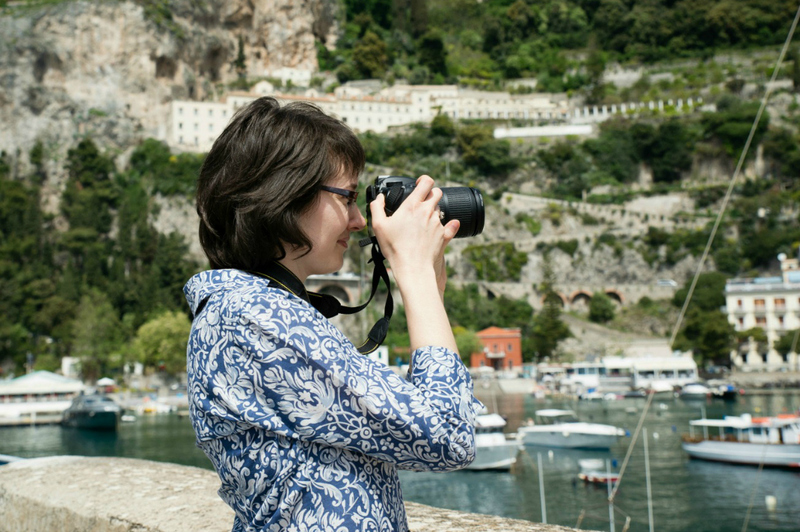 I hope to get to Capri with the camera again soon! It doesn’t take long to feel at home on the Amalfi Coast. 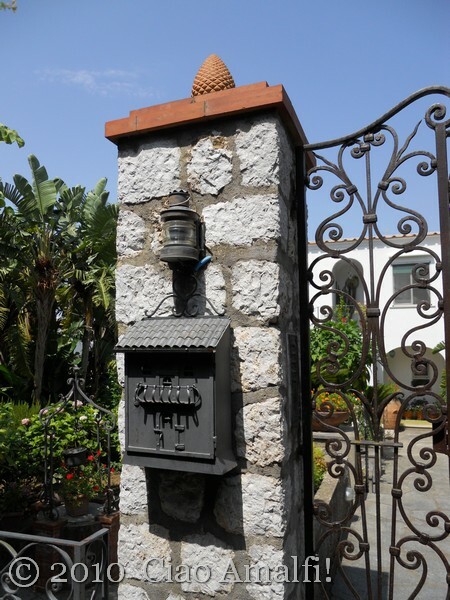 I imagine many travelers experience the same feeling of familiarity and comfort when they first arrive, just as I did in February 2007 when I first visited Amalfi. There’s a warmth, openness and curiosity for foreigners in many of the locals on the Amalfi Coast, which is an undeniable part of that welcoming feeling so many people find here. Speaking only a few words of Italy, it was certainly very welcome to me when I started spending more time on the Amalfi Coast! With a smile and a few words scribbled down in Italian on a piece of paper, shopping soon became a little less scary as the lady in the shop nicely corrected my pronunciation of “CI-polla” to “ci-POlla” when I needed onions. I didn’t understand anything anyone said to me, but slowly I began to learn a few words. It was hard, however, not to feel like an outsider when I didn’t know how to do simple things that I’ve never had to put much thought into before, like interpreting the bus schedule or buying herbs at the market. Every expat goes through these feelings, I believe, and I imagine everyone deals with them in different ways as well. I chose to focus on the little victories – the first time I got up the nerve to go into the butcher on my own, the first time I carried out a transaction at the post office in Italian, the first time I felt confident enough to start up a conversation with a stranger, actually being able to figure out that blasted bus schedule. With each success, I felt a little more at home. I’ve been reflecting a lot lately on that very feeling. What is it that makes a person feel at home? It’s a familiarity that comes only with time, but it’s something much more than simply living in a place for a certain period of time. For me, it has more to do with the way a place resonates within you through its sights, sounds and scents. Whether it’s the “invisible scent of lingering lilacs,” as it was for Proust, or simply the comforting view of the street where you grew up playing and laughing as a child, its those very personal experiences and memories that define home. But, more than anything, I’m starting to realize that home is where you’re happy. Yesterday evening I was out running some errands on the motorino before coming home. 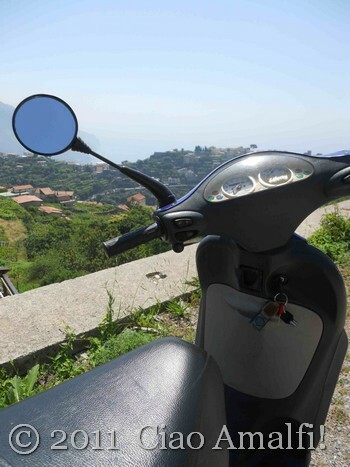 As I was riding along a beautiful road in Ravello overlooking the Amalfi coastline, I saw very clearly how, without even realizing it, my life has become interwoven into the panorama of daily life here. That even though I’m still a foreigner, I have started nevertheless to find my place. I smiled as a swerved around a vigilessa (a local policewoman in charge of traffic and city regulations) who had stopped in the middle of the road to take a picture of a nicely dressed couple with the stunning backdrop of the Amalfi Coast behind them. I smiled and beeped the horn as I passed Gaetano, who sells the sweetest peaches I’ve ever tasted. Around the next corner came a tilting Piaggio Ape, one of those tiny three-wheeled Italian vehicles, loaded at least twice its width and three times its height with bales of hay. I laughed out load hoping that he would make it to wherever he was going with all that hay. This is it, I thought. It doesn’t have to be complicated or philosophical or romantic or any of the thoughts that have been going around and around in my mind lately. Although I read Michelle Fabio’s words back in February this year, they suddenly clicked. “It really is the simple, stupid,” I thought. As I parked the motorino and walked down the steps to home, I smiled realizing that I had already found my home on the Amalfi Coast without really even knowing it. 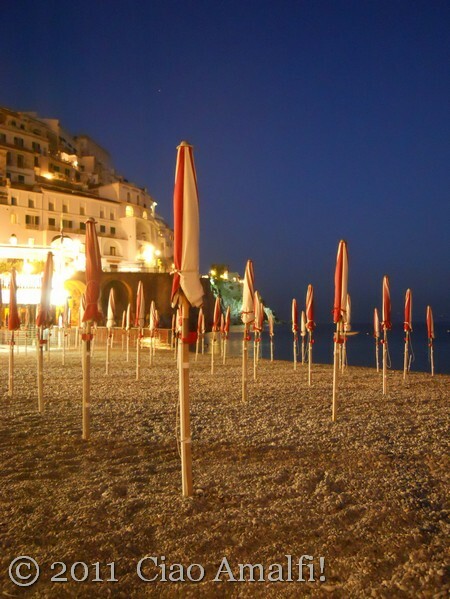 Last weekend I was sitting down on the beach in Amalfi, and I loved the way the beach umbrellas looked lined up and wrapped tightly for the night. Since I had some time to kill, I entertained myself by experimenting a bit with my camera. I like how this image came out, with the red and white umbrellas against the strangely blue night sky. Wishing everyone a sunny and fun summer weekend!